This is a Christmas News blog, full of information about the last posting days for Christmas delivery, Some last minute bargains in our Clearance Department and Buy 2 Get 1 Free Offer, as well as some gorgeous new Vintage stock. Sorry I haven’t updated my blog in a while, but the build up to the Christmas period and the added pressure of relocation has kept my attention elsewhere. Sometimes that Work-Life Balance we dream of goes a little off balance and you have to let one or two of the balls you are juggling drop to the floor. Luckily I am now picking them up one by one. My focus had to be on my relocation, and not allowing it to affect my customers in any way. 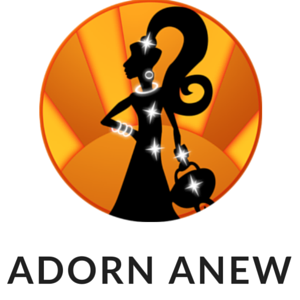 This is highlighted by our eBay Store adorn_anew hitting 5000 100% positive feedback. We are so pleased and it makes all our hard work feel so worthwhile, thank you everyone! Firstly I must highlight the last posting days for expected Christmas delivery. We expect there to be some delays due to a higher volume of mail at the moment, but as long as orders and payments come before the cut off dates, all the post should get through with no major issues. We dispatch with prepaid preprinted labels direct from Royal Mail, and all our items are handed over the counter for instant dispatch. Please see the last posting days via our eBay Shop page-Christmas Dispatch. We have opened our new Clearance Department in our eBay Store. Here you will find a variety of items previously offered at a higher price, some of which make ideal fun stocking fillers or Secret Santa gifts, or could even be that little treat for yourself. Our Buy 2 Get 1 Free Offer is going down well, with a selection of new stock items giving our customers a real Bargain this Christmas. Make sure you pop the items into your basket, and add all 3 to trigger the offer! Cheapest item is Free!!! Finally our new stock of Vintage Women’s Jewellery is really popular, and we have got such a varied selection at the moment, with prices to suit all pockets. Our Vintage Men’s Tie Clips, Pins, and Cufflinks is becoming more and more popular too with a growing number of repeat customers. We source from the US and the UK as well as Europe and have a great collection in stock.